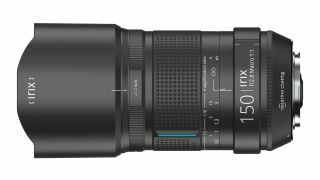 Innovative lens manufacturer Irix is launching its third prime lens at Photokina 2018... and it is going to be the Irix 150mm f/2.8 Macro. Following its 11mm and 15mm super-wide lenses that this new optical company has released so far, Irix has been teasing about the announcement about Dragonfly over the last couple of days – but now the full details of the lens have now been finally revealed. The lens uses three super-low dispersion glass (ED) elements, plus a further four high-refraction-index (HR) elements. Irix claims that this provides images with near-zero distortion (at a level of 0.1%, we are told). Focus is manual only, but precise control is offered with a wide focusing ring that rotates through a full 270°. The lens is supplied with a detachable tripod ring for stable shooting from a support. A deep lens hood is also provided. The 150mm focal length is longer than usual for a macro lens, but perfect for photographing outdoor subjects such as dragonflies, butterflies and insects – as it allows to photograph them at up to 1:1 magnification from a distance that is less likely to scare off the subject, or cast a shadow over it. Sigma already a 150mm f/2.8 EX DG OS HSM Macro lens. The lens is the first lens to come with what a new finish it has developed, that it has appropriately called Dragonfly. For this, the aluminium frame of the lens has been enclosed in an external structure made of aluminium-magnesium alloys and composite elements. This is said to combine the the features of the Firefly and Blackstone finishes offered on its previous two lenses.